Being a landscape and nature photographer as well as a weather nerd, I have long loved tornadoes. Back when I was little, my parents would order videos from the weather channel about the Andover, KS F5 tornado or the Jerosa, TX tornado. I marveled at the beauty and destructive nature of tornadoes but I lived in Monte Vista, CO where tornadoes are extremely rare. I have seen several funnel clouds but never an actual tornado living in the San Luis Valley. When I moved to Boulder I was introduced to severe thunderstorms that happen much more frequently. Over the years, I have spent nights trying to capture lightning because that is what I thought was most beautiful and breathtaking about severe thunderstorms. But then I started going out during the days to the eastern plains of Colorado, I became aware that the way thunderstorms form and the late afternoon light produce some brilliant scenes. So on May 27th and May 28th, 2018, I went out to capture these beautiful severe thunderstorms along the eastern plains. Colorado was supposed to have very active weather and many thunderstorms were expected to be severe. On the 27th, I went out to Ft. Morgan, CO to see a tornado producing storm but I arrived a little late to see the action. The storm had moved northeast and had become “rain-wrapped” and thus hiding from view. I’m not a professional storm chaser and my vehicle isn’t equipped to withstand an encounter with a tornado, so I decided to hang back near Ft. Morgan and see if there were scenes around there that would be worth shooting. 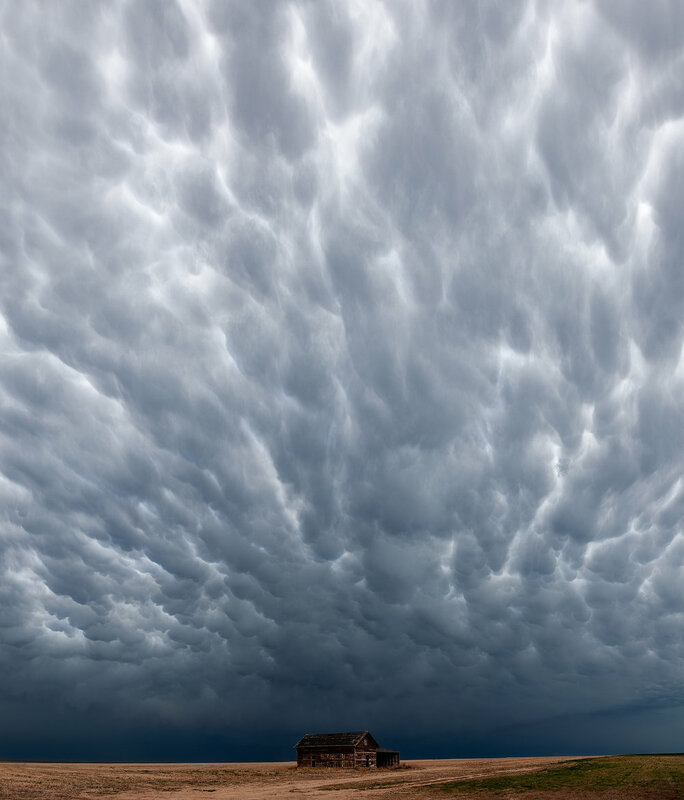 I looked up and saw a stunning display of mammatus clouds that typically form after severe weather had formed. You can read more about them here. These clouds are just plain cool looking and so I went in search of something to add in the foreground to compliment the amazing aerial display. North of Ft. Morgan, there is an airfield and near that airfield there is an abandoned building that provided the perfect foreground to show the vastness of the storm system. That was the only photo that I got that day because I wasn’t willing to drive into Nebraska where the storm was getting stronger and more organized. Which is a shame too because some storm chasers in Ogallala, NE took some incredible photos later that day. Content with my image, I returned to Boulder where my friend Matt asked me if I was going to go out the next day because there was supposed to be more storms. I said I was and we made plans to meet that next day in Denver. The next day we had to make a crucial decision because activity already firing up in Wyoming with an EF3 tornado on the ground north of Cheyenne, we could go to Ft. Morgan where there was a severe thunderstorm warning, or go east on I-70 toward Limon and get in on the action out there. We chose the latter of the options and were on our way to Limon soon after. The storms really started building after an unusually moist and cool day along the Front Range, and as we drove east a beautiful storm system towered over the plains below. We pulled off the highway and I took a few photos, which we didn’t know would prevent us from seeing a tornado up close. As we moved on toward Stratton, CO, the tornado that was on the ground for about 10 minutes had already lifted and we had missed out. We drove on to Burlington, CO where a squall line was building just west of the town and with it, I hoped we’d get to see one more bit of action of the severe weather variety. We did not. The day was far from a bust though because we got to spend a lot of good time talking, meeting other storm chasers, and seeing some incredibly beautiful scenes. Remember that storm chasing is a dangerous activity and should be done with caution at all times. Obey speed limits and road laws, keep a safe distance from storms, and listen to weather officials and law enforcement.